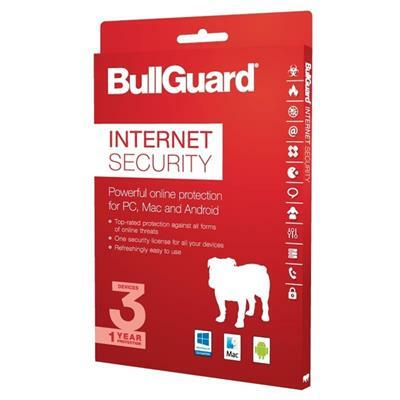 BullGuard Internet Security is simply the best online protection you can get. BullGuard is all about making you and your family safe online, so you can surf, shop, bank and game with ease and confidence. Game Booster optimises CPU performance while blocking pop ups and other annoying interruptions. You’ll enjoy noticeably smoother gaming without any lag. Blocks the access points that hackers like to exploit. Alerts users to missing security updates or insecure Wi-Fi networks and prevents apps that may contain malware from downloading automatically. • Comprehensive award-winning Parental Controls protects children from cyber bullying and predators. • Simple to set up, monitor and tailor online protection. • Single License protects PCs, Macs and Android phones and tablets. • Cloud-integrated Backup allows backup and encryption of files to Dropbox, Google Drive and One Drive. • Remote Lock and wipe, Locate with GPS and Scream alarm protects mobile devices from theft and loss. • Call manager function blocks unwanted texts and calls. • Top Rated protection for all the family andmulti devices users. • Refreshingly easy to use. We keep you safe and we keep it simple! Whenever you and your family connect to the Internet, there are risks involved, simply because it’s all happening online – the good as well as the bad. You need to protect yourself, your family and the computers you use. But you don’t want to be slowed down when you’re working, surfing, or playing games online. BullGuard is the only Internet Security vendor focusing exclusively on the home user and small office. BullGuard Internet Security has all the protection you’re ever going to need but it’s incredibly user-friendly and non-intrusive. That’s why millions of people like you trust BullGuard to simply keep them safe online. BullGuard is the perfect solution for the way we live today. BullGuard Internet Security lets you email, shop and bank with confidence, and with cloudintegrated backup your photos, music and documents are completely safe, whatever happens to your devices. Whether you’re gaming or banking, BullGuard’s simple-to-use protection doesn’t get in your way – total protection without loss of performance.